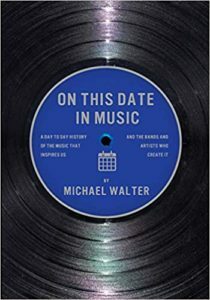 For weeks, we’ve highlighted “On this Date In Music” by Michael Walter. It provides a day to day history of the music that inspires us and the bands and artists who create it. What inspired Eric Clapton to write “Wonderful Tonight?” How did Hootie & the Blowfish get their name? Who turned down “Happy” before Pharrell turned it into a worldwide hit? What chance encounter led to one of David Bowie’s most successful albums? How did Colonel Tom Parker make money off non-Elvis fans? What current event forced a last minute lyric change in “Sympathy for the Devil?” Who is 2pac named after? Which band stole the show at Live Aid (and which band was a big disappointment)? How did Madonna turn an MTV ban into a record number of video sales? Why did Paul Anka write “My Way” for Frank Sinatra?